To continue the Barnstorming series, I had to give Dana and the rest of the gang something to do. The main invention was a fake Tellarite game called Kreesta. I wanted the most ridiculous kind of a sport imaginable. Hence Kreesta is a cross between competitive eating and table tennis. And yes, it is just as messy and undignified as you are probably thinking. 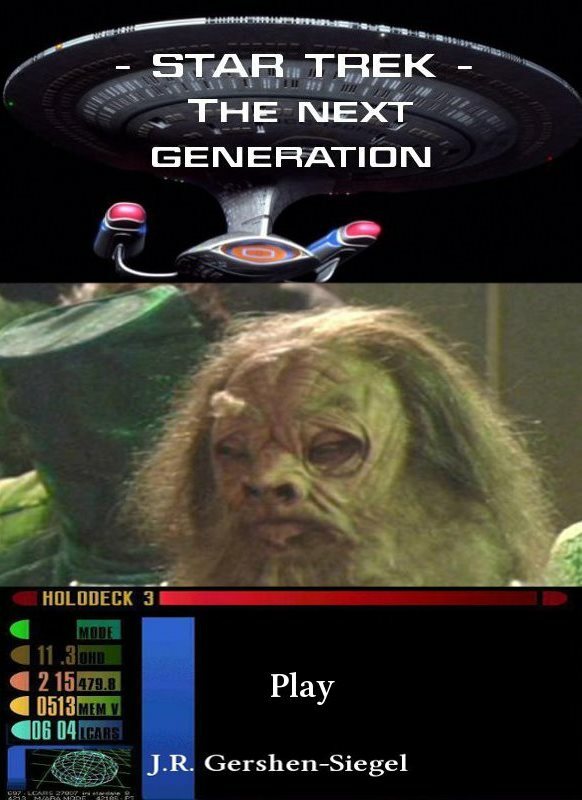 Play is the second story in the Star Trek TNG/ENT Crossover series, Barnstorming. The story follows Dana MacKenzie and her traveling sports team, as Martin Madden investigates a mysterious phenomenon. The story, at its end, sets up a crossover with ENT and with the Times of the HG Wells series. The story does not have any major music or musical themes. The real problem with this story is the one for the entire series. I was horribly burned out and so the ideas did not come as freely as before. In addition, I was ready to write a lot more wholly original works, full-time. This meant taking time away from truly developing this story line. And then at the end, I copped out in a lot of ways, and dovetailed into the old family. That is because I essentially grabbed the first canon character I could think of who could work, and I made him the anchor character. Martin Madden is the initial anchor character, but then Rick Daniels becomes the secondary. As a result, the story line got increasingly muddled and weird. And then it took a left turn into time travel, but that did work to fix a hole in the Wells series. So, yay? Maybe? Stocking Stuffers 2013! In 2013, Star Trek fanfiction writers got together. Hence we traded a bit of fun in each others’ universes. And this was my contribution. In order to follow along with the holiday theme (and Christmas isn’t even my holiday! ), I thought outside the proverbial box and tried to pull in various aspects of the holiday, everything from children believing in Santa Claus, to a long distance relationship at that time of year, to decorating a tree or even making it snow. However, for my own fanfiction, I selected Richard Daniels, right around New Year’s Eve, for the changeover to the new millennium. And Daniels also appears on the cover. This is because his portion of the story predates canon. However, for him, as it is for a lot of real people, the holidays are a time for reflection, for taking stock, and maybe even for some melancholy. And due to the switch from 1999 to 2000, Rick is also feeling the weight of everything changing. Because after all, in canon, World War III is supposed to start soon. Fortunately, in reality, we are still waiting for that. And hopefully, we will be waiting forever. Yet only Daniels really has music in his story (apart from Icheb playing and singing ‘Good King Wenceslas’). However, Daniels hears the music of the time, as he often does during his temporal meanderings. I would really love to do this again, as it was great fun. However, my only problem is, I might have run out of basic holiday premises to cover. Help a gal out, will ya? Since I had wanted to write a quick drabble, I pulled Rick Daniels into the Temporal Integrity Commission. However I also, potentially, wanted to attract another group of readers. Unfortunately, this did not really work. Hence I did not get the new readers I wanted. In 3096, Richard Daniels joins the Temporal Integrity Commission as a Temporal Agent. But in order to get him ready, he gets a bit of a background on his mission. And so the story introduces the commission. As a result, I included a smidgen of world building. The temporal agent gets a support team. After all, who would have watched Enterprise and thought he wouldn’t have one? Consider the scene where Daniels and Jonathan Archer see a ruined deep future skyscraper? Daniels says he ate lunch in there. An enormous building, by definition, means there would have been people in it. 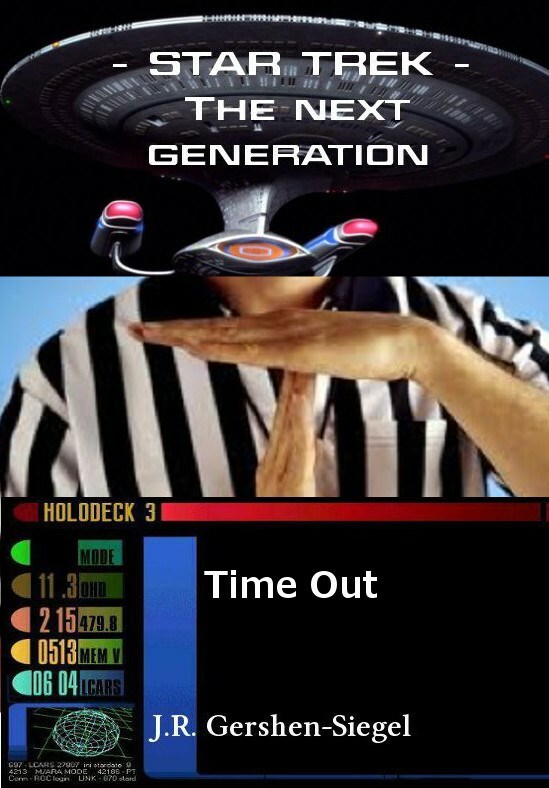 And those people – at least some of them, at any rate – should have been supporting the temporal agent. Otherwise, how could he accomplish his missions, or even select them? So the story is understandably short. But I feel that it is fair to middling. Since it’s not bad, but not great, either. And certainly more time could have and should have been spent on this particular event. Perhaps, at some point, I will write more about this and will flesh out the details better. But for now, it feels like more of a snack than a meal. November 13th works as a bridge story. It connects In Between Days to Times of the HG Wells. For a Weekly Free Write called ‘berth of a career’, I got the idea of a messy bunk in my head, and could not get it out. Adding to this idea was the Star Trek: Enterprise canon tidbit that Daniels had roomed with a slob. In order to anchor between In Between Days and Times of the HG Wells, it made sense to have a younger character. That younger character would be connected to Daniels, hence bridging the gap between In Between Days and the deep future of The Times of the HG Wells. Craig Willets, now an older man, would be dictating his memoirs, when he’d remember something quirky from his past. The date is what triggers it for Craig. He remembers a very specific, yet puzzling, event. On that day, back in 2151, he was just minding his own business, but was remembering his old roommate, who had left in a hurry. It had been explained to Craig that Daniels had been a time traveler. Craig wasn’t sure how he felt about that. As a slob, he has no idea, but a pair of his boots are missing. The action then shifts to 1699, where Daniels is preparing to bed Jennifer Crossman‘s ancestor, the widow Lucretia Crossman, in Penn’s Woods. This is to be Rick’s first temporal conquest. He’s eager to get going, and then realizes that he forgot something back in 2151. He excuses himself and goes to the only private place – the outhouse. While in there, he taps out a quick message to Craig and has the boots sent to November 13th, 2151. Why that date? That’s what date it is in 1699. But it does not match the date when Daniels departed from the NX-01. Craig realizes, much later, that his old roommate made a mistake with the date. I like the slight silliness of the story, that something so mild and minor could bring the two series together. To AU, or not to AU? To AU or not to AU, that is the question! Do you like writing alternate universes? Branching your characters off and seeing where a different path goes? Where do you start, and how do you go about it? When I got back to writing, after a hiatus of a few years, I found that the strictures of canon made it hard to get some of my points across. I also had a time travel series that had stalled but was, I thought, salvageable. But I had to make changes to it. I hit upon the idea of using Daniels as a kind of anchor character, to give people something to hang onto, when reading the stories. While I had already written some alternate or expanded types of universes, including Gina Nolan‘s world, things came together a lot better and with a lot more detail and finesse when I began to construct the HG Wells universe. Beyond the old time travel series, things also began with Temper. After some of the initial reintroduction of the arrangement and the five people in it, the action quickly shifted to 3109. Daniels would be witnessing something that could easily and undoubtedly show that time had been changed. I hit upon the idea of making his sister, Eleanor, the docent at a museum. She holds in her hands a sword, Ironblaze, and explains that it belonged to the Empress Hoshi Sato. Eleanor also performs a few more expository tasks and then the sword begins to disintegrate. Once that story ended, I felt there was unfinished business there with the deep future characters, and so I wanted to do more with them. Since I also wanted to incorporate a goodly amount of the old time travel series into the mix, I needed a bigger supporting cast for Daniels. He already had an engineer, Kevin O’Connor, and a boss, Carmen Calavicci. But he needed some more of a supporting cast. I already had the character of Otra D’Angelo, so she got some play, along with a Quartermaster, Crystal Sherwood, and others. These days, I get an idea for a story or a series and put it into a file called, not so imaginatively, Writing Ideas. I update it as I think of new things. Sometimes, the idea is a rather small one indeed, such as smart kangaroos. That was the germ of an idea for the Daranaean Emergence series. For the Barnstorming series, the idea was sports in space, but it’s evolving. Hence it also includes the idea of trying to tie together a lot of what’s come before. Therefore successor characters for In Between Days and Emergence come together, and prefigure characters in HG Wells. If I can get Eriecho and Gina Nolan and the Mixing it Up alien hybrids in there, then it’ll be so meta I might as well call it a day. Once the first idea is out there, I generally let it sit for a while. Often, I’m working on something else, or life has gotten busy or whatever. In the meantime, usually, my subconscious starts to work on things. I might dream about a series, or something like it. I also tend to think about such things while exercising. As I go along, I start gathering together what I want to do and what I want to comment on in my story/stories. For a series, I usually don’t confine myself to just plot. Often, there is something I want to say, some sort of philosophy I might wish to impart. Hence I’ll also think about what that is (e. g. for HG Wells, it was about how fate is quickly changed by little changes in time, and that you can’t necessarily trust your memory. For Emergence, it was about a quest for equality. Barnstorming is turning into knowing your heritage and embracing your past, warts and all). Getting an AU together involves getting organized. I keep a large overall timeline. Currently, it’s on this blog, in two pieces, prehistory to 2099, and 2100 to the end. It will likely be divided into a third and maybe a fourth piece, as the pages are getting rather unwieldy. The virtue of having a timeline is understanding birth and death dates more than anything else. If I know that Lili was born in 2109 and died in 2202, then having her meet Gina Nolan, who is from the 2300s, is impossible unless there’s time travel involved, on either or both ends. World War III starts here, in 2026 (Ohio). I’ve got the name and the information and the reference. There is also an overall Excel spreadsheet of characters, with names, genders, species (for hybrids, I just list them once, usually by their predominant species or whatever isn’t human. Kevin O’Connor has a listing as Gorn even though he’s part-Gorn and part-human). This is also where I list who “plays” a character, as that helps me to better understand people, if I can visualize them. As one might imagine, a lot of this information ends up in blog entries. I love creating original, alternate universes. If I could not, I imagine I would not find Star Trek fan fiction writing anywhere near as compelling. The Temporal Integrity Commission exists in canon. I love the name of this organization. It makes perfect sense to me. The Temporal Integrity Commission is a 29th century agency tasked with maintaining proper timelines. There is no canon evidence that it exists in the following centuries, or that time traveler Daniels belongs to such an agency. But canon doesn’t give Daniels a first name, either. Canon is maddeningly incomplete in a lot of areas. As a result, I have decided that Daniels, who I name Richard, works for the Commission. The Commission, to me, would have to be a fairly secretive organization. Otherwise, they could very well find themselves with people selfishly trying to use time travel for their own ends. They could be, maybe, seeking to make their ancestors more wealthy, or have them survive wars or plagues in order to, presumably, reproduce more, in order to make a family larger. Or they might go about things in a more sinister fashion, by trying to ensure that the ancestors of their enemies never reproduce. Therefore, I have decided that their workings would be pretty secret, including the location of headquarters. Rather than put them on a planet, they’re on a ship. In order to not give things away too much, the ship’s name is wholly unrelated to time travel. It’s called the USS Adrenaline. Given the fact that this is the very deep future, I don’t expect people to behave precisely the way that we do now (after all, we engage in behaviors that are absolutely alien to people from a millennium ago). This is how it should be. Dress, language, religion (if any) and education will all be radically different, just to mention a few dissimilarities. And lest we think we are so modern, consider this – less than ten years ago, there was no need to refer to home telephones as ‘land lines’. Phones were phones, and you rarely carried them around. Furthermore, behavior might seem odd to us. After all, we currently live in a far less formal society than we did even five years ago. Hence the TIC in my fanfiction has become a rather informal place. No one is called by their title unless they are being introduced. Admiral Calavicci, who is in charge of the Human Unit, often calls her employees children (out of affection and not malice). And people are dressed in all sorts of ways, rarely wearing uniforms unless they are expected to stay in. However, that last part is to be expected, as travelers would need to be suited up for the specific time periods they were visiting. The Commission and its dealings are, of course, at the center of the doings in the Times of the HG Wells series, but the reader’s first glimpse of my vision of the TIC is in Temper. At some point, Star Trek might broadcast a series covering pretty much only time travel. The trick is to make it different from the myriad of other series on the same subject. It is a compelling subject, to be able to either get a sneak peek ahead at the future, or fix the past. I don’t delude myself into thinking that such a series would be a lot like I handle the Commission, but I like to think I’m on the right track with my thinking.